Location: Situated just above Teifi flood meadows, some 1.1km ESE of Llechryd Bridge. Medieval church, dedicated to St David, exceptional for its pre- ecclesiological survival. It was probably altered in the C18 and repaired c1835-44, still in the Georgian manner, abandoned as parish church 1899, repaired 1905 and again 1948-73 under the Rev P Evans. Possibly early C14 parish church, altered in C18 and c1835-44, rubble stone with graded slate roofs. Nave and chancel with W bellcote, large W porch and added N vestry. The bellcote is large, roughly stepped in, with round- arched single opening and uncoped gable. Bell-rope slot down the W wall below. There is evidence of rebuilding in the nave NW angle and a big rough two-step diagonal NW buttress. W porch has asymmetrical roof, pointed centre doorway with cut-stone voussoirs and arched panelled double doors. To right, roof is extended out over taller depressed-arched recess for timber pedimented monument to Lewis family of Clynfyw, 1789. 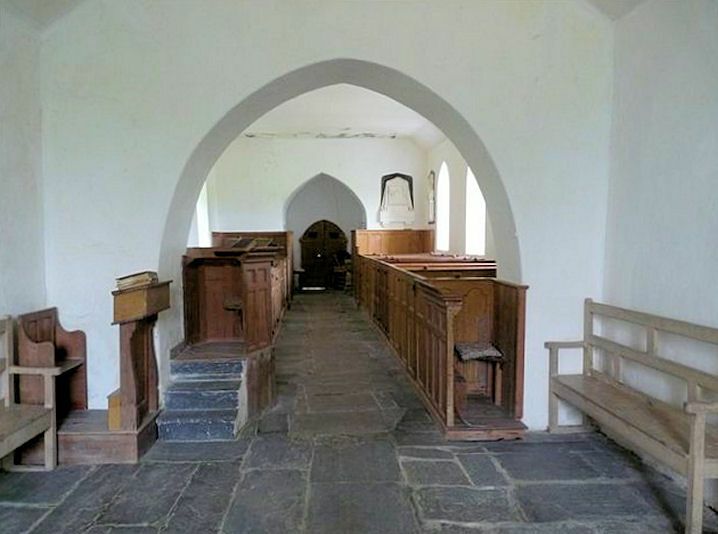 Nave N side, rebuilt c.1835-44, has three pointed windows with glazing-bar sashes and Cilgerran stone voussoirs. The sashes have Gothick intersecting bars. NE two-step buttresses. Chancel N has low cambered arched N doorway with stone voussoirs and plank door, and gabled vestry with W door and pointed N window with Gothick sash. Vestry and chancel walls are unbonded. Chancel E has broad Gothick sash with sandstone voussoirs. Chancel S has late C14 flat-headed 2-light window with cusped lights, the head carved as if for a third light to right, and then, under an eaves gable, a long inscribed slate to the Saunders of Pentre, plus 1750-1803, to the left, a small rectangular single light, hollow-moulded, C15 or C16. Nave S has SE chimney and three pointed sashes similar to those to N, but with some sandstone voussoirs. Simple plastered and whitewashed interior with flat ceilings and pointed chancel arch. Rough stone vault at W end. Slate paving through nave and chancel with raised three-sided altar platform. Box-pews in nave; two (at W end) for Ffynone and Castle Malgwyn, taller with fluted columns at angles, partly cut down to E. Plainer box-pews of various dates in between and then two larger E pews, for Pentre and Clynfyw, fitted with fireplaces. Plain panelled pulpit partly built onto the SE pew, probably cut down and moved from S wall centre, where there are now open-back benches similar to those in the chancel. In chancel altar platform of two steps with earlier C19 Gothic timber rails on three sides. Fine square font with fluted underside, circular shaft and square base. Three square panels each side with crude quatrefoils but opposed half- circles appear on E side, suggesting a C13 date, with ornament of the later C14. N side is obscured. Monuments: In chancel J Morgans of Vaynor (d.1712), crudely lettered, and Rev J Blackwell (d.1840) by Denman of London. In nave NE Leoline and Anne Davies of Clynfyw (d.1747), SE marble monuments to Dr David Davies (d.1829), Susanna Davies (d.1823) neo-Grec, and in NW H O Colby (d.1837) neo-Grec, and Capt C Colby (d.1852), military, by E G Physick. Listed Grade II* for its outstanding, though humble, character remarkable in lacking apparent Victorian contributions. Situated around Old Church, some 1.1km of E of Llechryd Bridge. Situated some 300m SE of Manordeifi Old Church, on hillside above Teifi. Situated down drive of some 500m running E from junction of road to Boncath and Garnon's Mill Road. Situated on E side of lane from A 484 to Neuadd Cross, some 500m N of A 484.